Today, dear brethren, the Church commemorates the Holy Fathers of the 7th Ecumenical Council. At different times throughout the year, the Holy Fathers of the other six councils are likewise commemorated. The Church has decreed that the ecumenical councils be remembered, first of all, in order to honor the great Church Fathers, who, guided by the Holy Spirit, have labored so earnestly to cleanse the Church of iniquitous heresies and to restore the truth of Church dogmas. But that is not the only reason. It is also very important for us not to forget the work of the ecumenical councils because, although all the heresies that were examined at the councils were absolutely condemned by the Holy Fathers, these heresies have not disappeared from church life. These heresies exist among us even today, the sole difference being that, on a par with the microbes and viruses which have so proliferated in the surrounding environment, these heresies have mutated, have adapted themselves to current times, have taken on contemporary forms. It is, therefore, very important for us, while appreciating the fact that we are within the true Church, and remembering the efforts of the Holy Fathers in this matter, to acquaint ourselves with the heresies which the Fathers have condemned, and to try to discern them in our contemporary life, in order to avoid being ensnared by them. 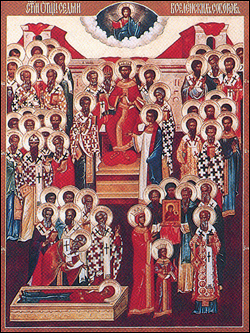 The Holy Fathers of the 7th Ecumenical Council, whom we commemorate today, condemned the heresy of iconoclasm. This heresy originated in the early 8th century, when the Greek Emperor Leo III decreed that all holy icons be taken out of the churches and homes, and burned in the city squares. The decree was motivated by a false belief that the veneration of icons was a form of idolatry. When the people began to resist this decree, to the persecution of icons Emperor Leo added the persecution of venerators, and many of the faithful were tortured and killed at that time. Nevertheless, the people continued to revolt against the Emperor’s decree, and prominent theologians of those times wrote from all sides, denouncing Emperor Leo: as, for example, St. John Damascene from Syria and Pope Gregory II from Rome. After the death of Emperor Leo, his son and successor, Constantine Copronimus, continued the iconoclastic efforts of his father, but decided to try a different approach. He convoked a false council, at which the clergy that he had set up condemned the veneration of icons. As a result of this false council, not only did icons continue to be destroyed, but also priceless frescoes on the walls of famous cathedrals were plastered over. From persecution of icons Constantine turned to a persecution of holy relics, and then to a persecution of monasteries, which were all either destroyed or turned into barracks, while all the monks were brutally martyred. The heresy of iconoclasm continued practically throughout the 8th century, and only towards the end of it, during the reign of the pious Empress Irene, the veneration of icons was restored. Through the efforts of the Empress, backed by the Patriarch of Constantinople Tarasius, the 7th Ecumenical Council, attended by more than 300 bishops, was convoked in A.D. 787. The council fully condemned the heresy of iconoclasm, condemned the false council that had been convoked by Copronimus, and triumphantly restored the veneration of icons by establishing the principle that in honoring icons we honor and venerate those who are depicted on them. Centuries passed, dear brethren, and iconoclasm seemed to be a thing of the past, but in the 20th century it raged anew with great force in the Christian countries that had been subjugated by godless Communism. And once again one could see icons being burned, churches and monasteries being destroyed and defiled, the clergy and the faithful being martyred. But now everything appears to be quiet again, and it seems that this heresy has finally disappeared for good, since nowhere apparently are holy icons being destroyed, nor is anyone being martyred for venerating them. And yet, dear brethren, iconoclasm continues to live on, it has not disappeared, it is alive and active, it has simply changed its form. For the devil is quite cunning: he has seen that open persecution of icons simply engenders martyrdom, which does not suit his plans at all. And so he has decided upon a different approach. Instead of suppressing the veneration of icons, he has decided to replace this veneration with another kind of worship. This is in accordance with the same principle on which the Antichrist will operate. In Greek the word “anti” not only means “against,” but also “in place of.” Thus, after appearing in the world, the Antichrist will not only act against Christ, but also instead of Christ, i.e. he will set himself up in Christ’s place. The devil has applied the same method to iconoclasm: instead of struggling against icons, he has put forth other objects of worship in place of icons. What are these anti-icons which we see around us, dear brethren? Regard: in the majority of contemporary homes you will rarely see true icons – icons of the Saviour, of the Theotokos, of the saints. At best, and only in the homes of the faithful, somewhere in the corner, in accordance with ancient custom, you will see one small icon, which often, moreover, embarrasses us in front of visitors of different faiths. But in the majority of homes, particularly in the rooms of young people, you will surely find pictures of rock singers, actors, and other contemporary idols. Even in modern technology computer images are called “icons.” It is these anti-icons which the devil slips to us in the place of true icons. And the same principle applies in this case: in honoring these images we honor those who are depicted on them. Thus it turns out that instead of God we worship idols. So cunningly has the devil ensnared us! Dear brethren! Let us reject these anti-icons of the anti-religion of the coming Antichrist. And, in commemorating today the Holy Fathers of the 7th council, those great fighters for the true veneration of icons, let us follow their example: let us restore the veneration of icons in our hearts, in our lives, in our homes. Let us come to church, where the Lord Jesus Christ, the Mother of God, the saints – all look upon us so tenderly, where we can communicate with them directly by venerating their images. And in our homes let us, without any embarrassment, hang up in the most prominent places icons of the Saviour, the Theotokos, various saints – who protect us from evil, guard our homes, look after us; with whom we can always “converse” by means of prayer, share our joys and our sorrows, ask for help; so that even when we are alone at home, we are never lonely. Thus, through the veneration of icons, let us communicate with the heavenly dwellers, so that we, too, may some day become denizens of the heavenly realm. Amen.